To make CrazyStat detect Windows 8, just replace stat/usr/keywords/os.txt with the one I just committed to svn. Just upload this file to stat/usr/keywords. I just noticed that I have not announced yet that CrazyStat has been translated into Portoguese by Pedro Cruz. Thanks a lot! You can already download the file from SVN (click “Download this file”). Of course the file will be included in the next release. Just upload it into your stat/src/lang-folder and select the language when logging in. You can also change the default language. If you find any mistakes in this or any other language file, just let me know. I hope you enjoy CrazyStat! 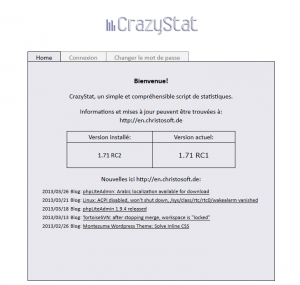 Today I released CrazyStat 1.71 RC1, the first Release Candidate of version 1.71. As there have already been two beta-versions tested by some testers, I consider this release candidate quite stable. I expect that no or only small changes will be made for the final version. 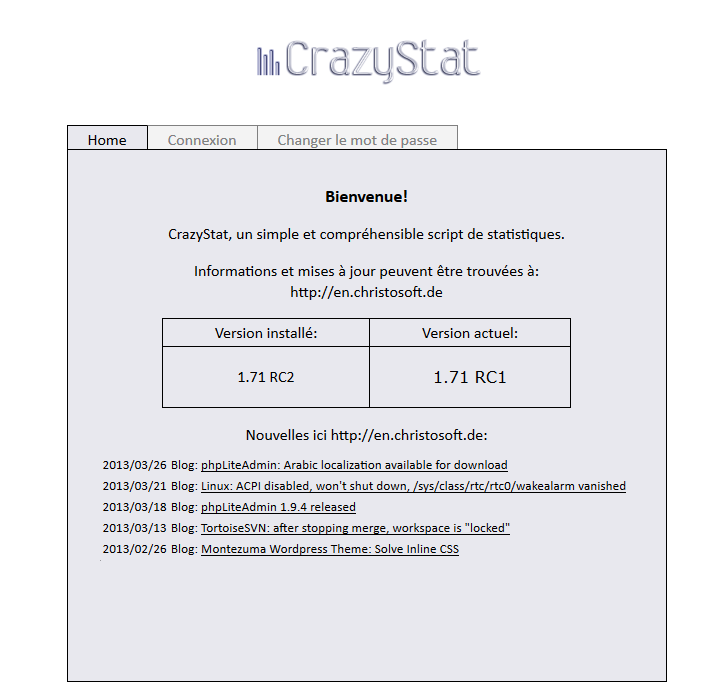 Therefore, I’d like to encourage all CrazyStat users to update CrazyStat to 1.71 RC1. It is very simple, as described in the FAQ. New languages: Russian and Danish. Thanks a lot to the translators Vladimir and Liza! I hope CrazyStat will be translated into more languages soon. It is really not much work. Please contact me if you are interested. PHP4 support dropped. I removed all workarounds for old PHP versions. Now at least PHP 5.1 is required. If your host is still running PHP4, you should really update or change to another hoster. PHP4 is not maintained for quite a while now. Also support for old GDlib-versions was dropped (1.x). You can now link the entries of the file-module to the files. See the config setting you need to set. IP anonymization reworked. This is now turned on by default. See FAQ for more information. New Browsers (Firefox-Versions), Bots, Operating Systems etc. So this is more a maintenance release, not a major whole new version. See history for more details (with CrazyStat’s new public SVN hosted on Sourceforge, you can even track every individual change). I hope you enjoy the new version. You can download it here. Tell me what you think about it in the comments. In case you have problems, please ask in the support forum. CrazyStat version 1.70 (and before) detects Firefox version 11 (and upwards) as “Firefox 1.x”. Firefox versions were really coming up fast lately, so I did not finish version 1.71 to get all those new versions added before they come out. To fix this issue in 1.70 (or before), simply add “Firefox/11=Firefox 11” to stat/usr/keywords/browser.txt or even better download the current browser.txt from SVN. Just replace the file and clean the cache. Note that you can easily customize browser detection as described in FAQ. Of course this won’t be an issue in upcoming 1.71. Finally, CrazyStat’s SVN has gone public! In the SVN repository, you can find the current CrazyStat 1.71 development version (in the trunk) along with 1.71 beta1 and beta2. You can also read the commit logs to see what is going on with CrazyStat development. In case you want to test the upcoming CrazyStat version 1.71, I’d recommend checking out the current development version from the trunk. Please let me know if you find any bugs or issues with the current development version (which will soon become RC1…). 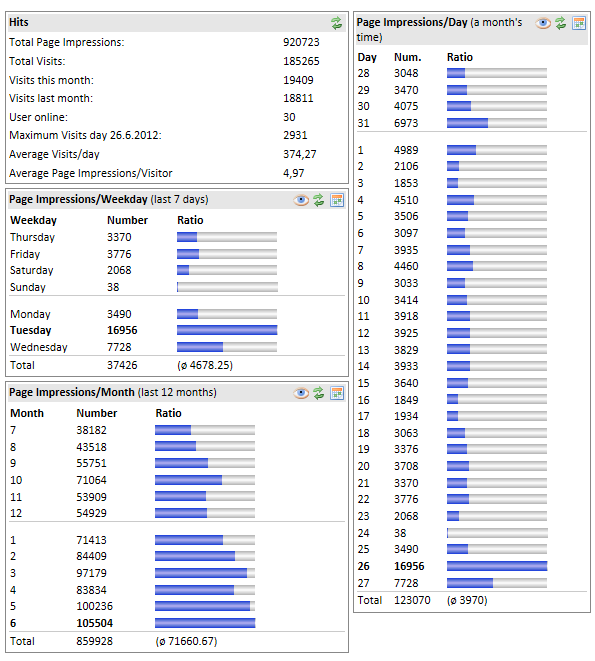 This is part of my plans to make development of CrazyStat more open. Today I would like to introduce Christosoft Forum. It is meant both for support, especially about CrazyStat, but also any general discussion about things of common interest. I hope it will be used especially for CrazyStat support. You do not even have to register at the moment, you can post as guest if you solve a captcha. Let’s hope I can keep this setting and it won’t be abused. So from now on, please use the forum if you have any problems with CrazyStat. Other users might help you before I find the time or you might find the solution for your problem in an old thread. Let me know what you think of it, either here or in the forum. Also let me know if you have suggestions, e.g. for subforums or forum settings.